There may be a new Nexus 10 coming, but that doesn't make last year's Samsung tablet any less impressive. If you've had your eye on the 32GB version of Google's biggest, fanciest Nexus, eBay has a deal for you: $130 and just over 25% off the retail price. Yup, the 32GB Nexus 10 is on sale right now for $369.99, which is $30 cheaper than even the 16GB version in the Google Play Store. Is the new Nexus 7 not doing it for you? No wonder: you want a manly man's tablet! For men! (And also women who appreciate high resolution and fast processors.) 1080P? That's like a baby's toy! 7-inch screen? You laugh with scorn! 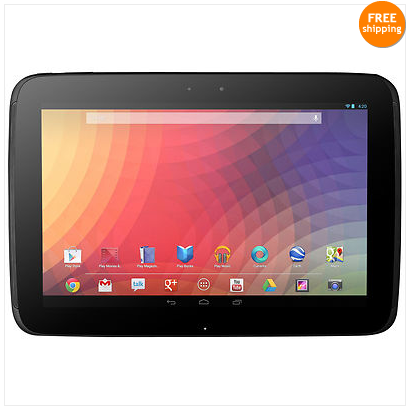 If you're busting with all this technological machismo and a burning desire to save money, eBay's got you covered: the Nexus 10's 32GB model is currently on sale for $399.99, matching the 16GB model after a $100 discount off the retail price. Wall Street Journal reporter Amir Efrati has let it slip that none other than Chrome/Android head Sundar Pichai has divulged the existence of a next-generation Samsung-made Nexus 10 tablet. If Pichai related more details to Efrati, he's keeping them under his hat. 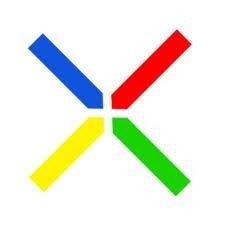 Still, Samsung is more or less confirmed as the OEM for Google's next 10-inch slate. 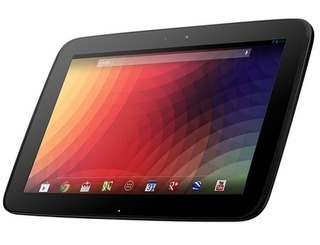 The Nexus 10 was announced along side the Nexus 4 late last year. 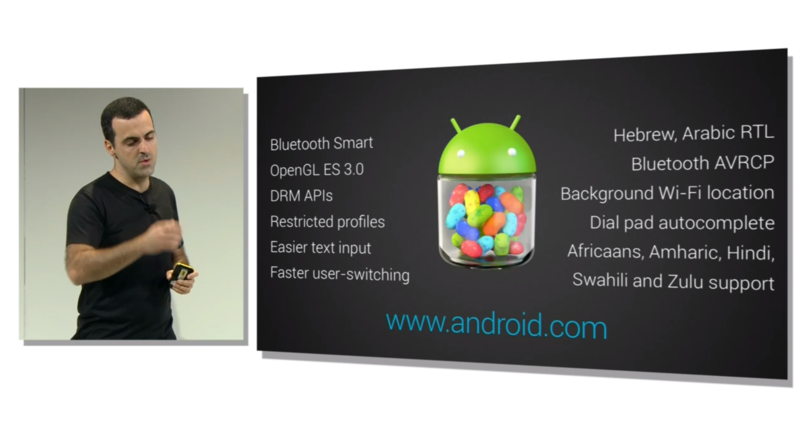 Google officially unveiled the newest version of Android this morning – Android 4.3 Jelly Bean – and of course the first question is when can I have it?! Good news for current Nexus owners: it's coming today. The current edition Nexuses – 10, 7, and 4 – along with the Galaxy Nexus (GSM is assumed here), will all begin getting the update as of today. Of course, there's another big question here: when will the Google Play Edition HTC One and Samsung Galaxy S 4 get the update? 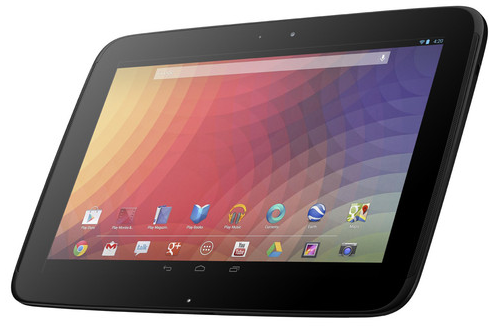 If you want a 10-inch Android tablet, it's difficult to look past the Nexus 10. It has a beautiful display, incredibly snappy processor, 2GB of RAM (which makes a huge difference), and possibly the most important: it's a Nexus. It' pure Android experience and straight-from-Google updates make it a killer tablet in its own right. If the $500 price on the 32GB model is just too much for you to justify, there's a solid offering going on eBay Daily Deals today: a manufacturer refurbished N10 is only $350 with free shipping and no tax for those outside of Washington state. Google's anointed Android tablet is a pretty good deal even when you buy it at retail, but there's a solid deal for the Nexus 10 on eBay right now if you don't mind refurbished hardware. 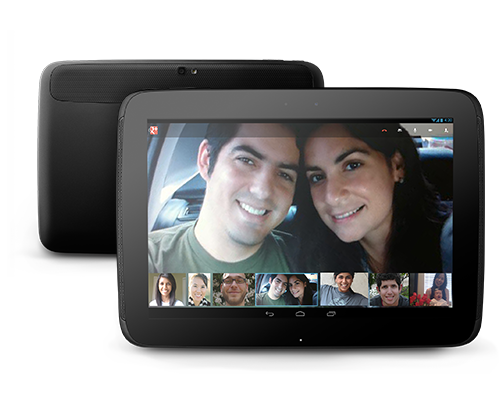 This is the 32GB variant of the tablet, which usually goes for $499. So this deal saves you $110. You might look at this deal and think it sounds pretty mild. 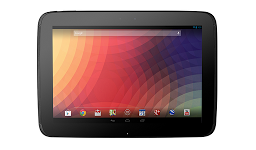 After all, the Nexus 10 is only $399 from Google Play. However, this deal can be had tax free outside of California and includes free standard US shipping. 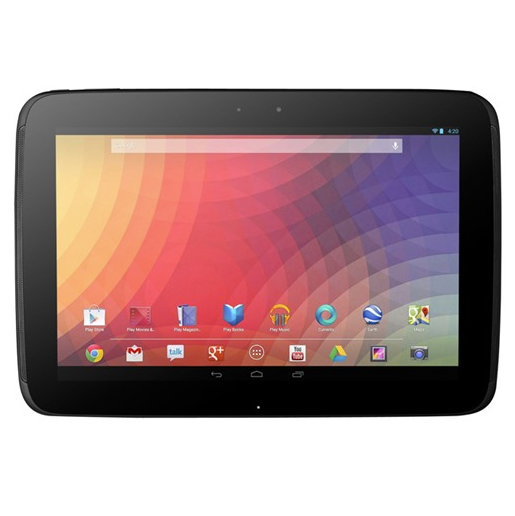 This listing is for a new-in-box 16GB Nexus 10 just like you'd get from Google Play – WiFi-only, Android 4.2, Samsung Exynos 5 dual-core chip, amazing screen, and so on. 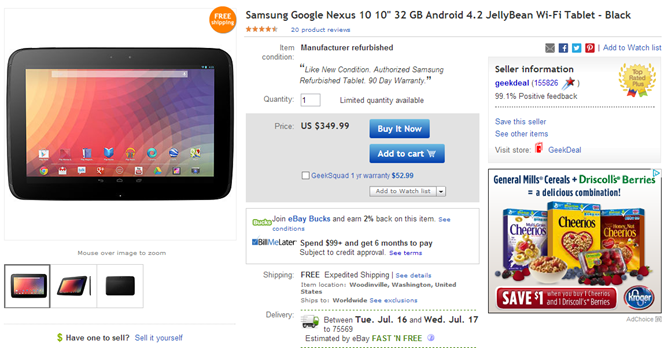 Buying this tablet from Google will probably rack up taxes in the range of $30, and shipping is $13.99. It's been more than half a year since Google officially unveiled the Nexus 10 tablet, and the Samsung-made device has yet to be dethroned as the debatable king of Android slates. If you've been waiting for a sweet deal to grab your own, you'd better hurry: the closeout specialists at Woot.com have the 32GB version on sale at Tech.Woot for just $380, a whole $120 off the Play Store retail price, and still cheaper than the 16GB version at most outlets. In the interest of time, I'll spare you, dear readers, my usual spiel and say simply this: I like official accessories. In theory, anyway. I like the idea of accessories specifically made for specific devices by the device's original manufacturer. 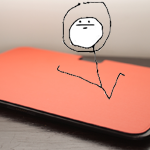 I've been delighted by the Nexus 7 pogo dock, and love the Nexus 10 pogo charger (though it isn't actually official yet). Then there's the official book cover for the Nexus 10. 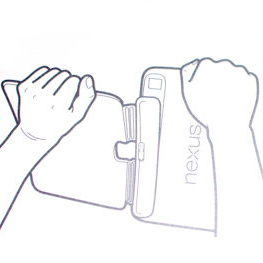 Were The Nexus 10 Book Covers Left Lying Around For Months Prior To Release? Just last week, we saw the launch of the elusive book cover for the Nexus 10 – the only official accessory of its kind to come out of the Play Store for the 10" slab. Since we spied it at the Nexus 10's original launch, all had been quiet. Presumably, the covers simply weren't ready to be sold. Naturally, I had to pick one up and give it a shot. After all, I have something of a penchant for official accessories, and promised to give it a quick look.